Appearing about 2.5 million years ago, Homo habilis, also known as "handy man," was a turning point in human evolution because brain enlargement was truly dramatic. This was revealed through skulls found in Africa, which exhibited a rounded cranium resulting from the increase in brain capacity. The brain capacity is larger by 21% than its most likely ancestors. Perhaps because of an advanced mental connection, Homo habilis developed a characteristic that is uniquely human, the technique of making tools. Less than 1.52 meters tall and weighing under 45 kilograms, it is debatable that habilis hunted. Most likely they were scavengers instead, supplementing a mostly vegetarian diet with meat left over from predators' kills. The most complete hand of Homo habilis found in Olduvai Gorge, the structure of which was compatible with an ability to make tools. Stone artifacts, choppers of the Pebble industry and sharp flakes of the Oldowan technology, first appear in the record about 2 million years ago. According to some estimates this coincides with the evolution of Homo habilis . Such an estimate neatly falls in with the tendency to view stone tool making as a uniquely human, namely Homo, ability. The most significant fossil is the isolated femora found in East Rudolf. These femora do not differ from those of modern humans in any feature related to movement or posture. However, they differ, in very subtle ways, from the femur of australopithecus. The head of the femur, where it joins the pelvis, shows change, though its functional significance is unclear. They may not have to do with locomotion as they do with widening of the pelvis to allow for the birth of bigger brained, larger headed babies. In addition, whereas the shaft of australopithecines femur was columnlike, the femur of habilis , like modern humans, has a "waisted" shaft that narrows towards the middle. The teeth and jaws of Homo habilis are quite similar in size and proportions to those of the less specialized, earlier australopithecus species. The back teeth are large, and the incisors are not disproportionately smaller. The molars of habilis are somewhat more narrow than the typical australopithecus, and in later species they are clearly smaller. These changes suggest that tools were now being used to do part of the molars' job of crushing and grinding foods. The incisors, however, remained large. This indicates that they had an important function, perhaps related to meat eating. Since cooking meat had not yet been developed, habilis needed a substantial set of incisors for tearing tough raw meat and gnawing it off bones. Appearing about 1.9 and 1.2 million years ago, Homo ergaster had a higher skull dome, thinner cranial bones, slim brow ridges, a light skull, and generally lighter build than Homo erectus. It had a swift gait, with long well muscled limbs, and narrow hips. The body shape and proportions were very similar to modern humans living in tropical climates. One of the most spectacular and important paleoanthropological finds in recent years was the "Nariokotome Boy." This find represents the most complete early hominid ever found, with almost the entire cranium, and most of the postcranial material intact. This specimen has been attributed as a male Homo ergaster by some, though most place it in Homo erectus, and that is where it will be discussed in detail. 1.) Increased cranial breadth across the parietal bones. 6.) Greater development of the mandibular symphysis. 7.) Narrower M1s and lower canines. However, these traits have been found in the Asian Homo erectus, further confusing the issue of who is closer to Homo sapiens. In short, Homo ergaster does not show significant promise of lasting as a separate taxon due to several factors. It has not been shown to significantly different from Homo erectus to require the designation of a new hominid species, and it has not been shown to be closer to modern humans morphologically as has been claimed by some. At this time, Homo ergaster basically means early Homo erectus from Africa. Appearing about 1.8 million years ago, Homo erectus left Africa and spread to Europe, Indonesia and China. Its cranial capacity was from 800 to 1200cc. It featured a long, low cranium, with prominent browridges, and thick skull bones. It had large incisors and canines, but small molars and premolars. The incisor teeth of Homo erectus generally have a "scooped out" appearance on the tongue side. Its body size was approximately the size of Homo sapiens. Its postcrania (arms and legs) had a robust build but were distinctly human. This may be because we sit behind a desk and Homo erectus actively used their arms and legs more throughout the day. There was a significant increase in body size compared to earlier hominids. Past estimates were in the 5- 5 1/2 foot range for adult males and around 100 pounds or a bit more. The discovery of "Turkana Boy" in 1984 brought this into question. It is the most complete and the earliest of this species discovered so far. The boy was only 12 years old when he died but already 5 feet 3 inches tall. If he had lived to adulthood, he very likely would have grown to 6 feet. Homo erectus used the Acheulian tool kit, which consisted mainly of choppers, hand-axes, and scrapers. Scientists are sure that Homo erectus hunted. The evidence includes traps and cut marks obviously made under that of a carnivore tooth mark. Homo erectus was the first known to use fire. This is supported by charred bones and stones found in the many Homo erectus sites all over the world. Fire provided a great number of advantages, including warmth, light, safety from predators, and cooked food (easier to digest). It was fire that allowed Homo erectus to migrate (one of the many migrations) north into Europe. The earliest sign was in Spain, in which the northeastern region was inhabited by Homo erectus more than 800,0000 years ago. It arrived in France at around 450,000 years ago, where we find temporary huts made of sticks, stuck in the ground and surrounded by a circle of stones. The earliest Homo erectus apparently were contemperaries of the late Homo habilis in East Africa for several thousand years. This suggests that the immediate ancestor of Homo erectus was an early Homo habilis or even another yet to be discovered species of early human. Late breaking news: In the May 12, 2000 issue of the journal Science , it was announced that the Homo erectus fossil remains from Dmanisi in the Republic of Georgia are much older than previously believed. New dating places them at 1.7 million years ago. It is further suggested that the Dmanisi skull looks like Homo ergaster, the earliest Homo erectus -like species from Africa. If this is true, it means that Homo ergaster did not only live in Africa. The Dmanisi date also lends credence to the 1.8 million year old date from Java for Homo erectus. The first specimen of Homo heidelbergensis was found in 1907 at the Mauer sand pits near Heidelberg, Germany. A nearly complete mandible was discovered by a quarry worker. The archaeologist Otto Schoetensack named the hominid mandible H.heidelbergensis. This particular find dates to roughly 500,000 years ago. Homo heidelbergensis existed during parts of the Lower Pleistocene into the Middle Pleistocene. From approximately 800.000 years ago until the appearance of anatomically modern humans Homo sapiens. Remains were found in Europe and Africa. Little is known so far about how this group fit into the hominid timeline, but it is thought to have possibly evolved into Homo sapiens (perhaps with an intermittent species not yet found) and Homo neanderthalensis. H. heidelbergensis is identifiable by its robust cranium and strong dental features. Heidelbergensis also shows an increased brain size compared to H.erectus. base to the parietal regions. - the rear of the cranial vault becomes more vertical. - a gradual reduction in cranial robusticity. Some major findings of H.heidelbergensis are located at Atapuerca.Spain. 1300 human fossils representing 30 individuals have been found. They date between 780.000 years and 300,000 ago. H.antecessor was first discovered in Gran Dolina at Atapuerca, Spain in 1995. The new species was named H.antecessor by J.L. Arsuaga. The species was named antecessor meaning explorer in Latin. He was probably the first one to "explore" Europe. According to Jose Maria Bermudez he is the oldest known European and appears to be forebearer to H.sapiens and H.neanderthalensis . He lived during the lower Pleistocene at approximately 800.000 years ago. H.antecessor shows a mixture of "archaic" and "modern" traits, with an especially modern-looking mid face. "This combination of characteristics is unique. It doesn't appear in any other hominid," said Antonio Rosas, a co-author of the study published in Science. "From a logical viewpoint, it fits into an easily definable space, the common ancestor of Homo sapiens and Neanderthals ." The more modern facial characteristics of Homo antecessor have previously only been seen in hominids more than half a million years younger. In other respects it more closely resembles Homo ergaster, a very primitive hominid. Living in forests of oak, pine and beech trees, these hominid ancestors were most likely hunter gatherers. Human tooth marks on human bones indicate cannibalism. well as creating a whole new species: H. antecessor. Anthropologists will now have to redraw the family tree to include a branch for Homo antecessor . - his brain size is 1,000 cc. 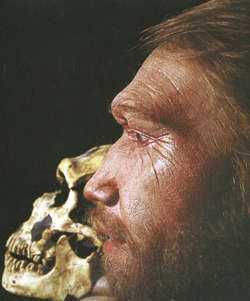 Homo neanderthalensis was first discovered in 1856 in the Neander Valley near Duesseldorf, Germany. Workmen in a limestone cave found the remains of a skull, hip bones and other parts of the skeleton. Johann Carl Fuhlrott, a local naturalist and the anatomist Hermann Schaffhausen, were the first one's to identify the bones as hominid. H. neanderthalensis existed during the cold climate of the pleistocene from ca. 200.000 ago until 30.000 years ago when the species became extinct. Neanderthal sites were found in Europe and the Middle East. Neanderthals created Mousterian stone tools including spears, using a core and flake technique during the Middle Palaeolithic period. They hunted for meat and cracked open animal bones to get at the marrow . Researchers found a high concentration of break and cut marks on animal bones indicative of butchering at Kobeh Cave. They were probably omnivores but behaved as carnivores, with animal protein being their main source of dietary protein. Neanderthals created ornaments for personal adornment. They buried most of their dead in a flexed position.The graves sometimes contained gifts. For example stone or bone implements, ochre or animal bones and flowers. Even though H.sapiens and H.neanderthalensis were contemporaries for approximately 10.000 years recent DNA studies seem to indicate that there was no interbreeding between H.neanderthalensis and modern H.sapiens. The oldest known Homo sapiens remains are 100.000 years old and were found in several places in South Africa. Approximately 50.000 years ago H.sapiens moved into western Asia and then into Europe. During this time of the Upper Palaeolithic( 40.000 B.P. - 10.000 B.P.) an innovation explosion occurred. H. sapiens created an extensive tool kit out of stone. Blades, scrapers and projectile points were manufactured using a special flaking technique. Materials such as bone,antler,wood and ivory were used for spears as well as bow and arrows. The Upper Palaeolithic shows evidence of elaborate human burials, cave art, portable art, personal adornments, and decorated tools. Also a dramatic change in human behaviour occurs, which becomes apparent in more efficient foraging strategies and complex social organizations. It is assumed that an increase in brain size as well as the development of language is responsible for those changes. 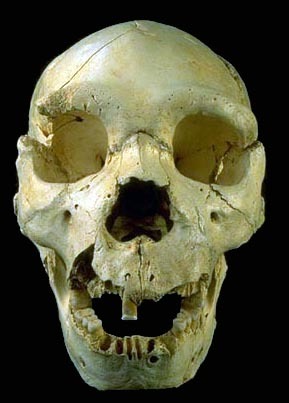 The pictured skull is called Cro Magnon. It is 30.000 years old and the oldest European H.sapiens found in France. a) The "Multiregional Hypothesis" states that all modern humans evolved in parallel from earlier populations in Africa, Europe and Asia, with some genetic intermixing among these regions. Support for this comes from the similarity of certain minor anatomical structures in modern human populations and preceding populations of Homo erectus in the same regions. b) The "Out of Africa Hypothesis" proposes that a small, relatively isolated population of early humans evolved into modern Homo sapiens , and that this population succeeded in spreading across Africa, Europe, and Asia -- displacing and eventually replacing all other early human populations as they spread. Part of the evidence to support this theory comes from molecular biology, especially studies of the diversity and mutation rate of nuclear DNA and mitochondrial DNA in living human cells. From these studies an approximate time of divergence from the common ancestor of all modern human populations can be calculated. This research has typically yielded dates around 200,000 years ago, too young for the "Multiregional Hypothesis." Molecular methods have also tended to point to an African origin for all modern humans, implying that the ancestral population of all living people migrated from Africa to other parts of the world.